The Alder Food Security Society is led by our Board of Directors, who come from a variety of backgrounds in the food community, community development, activism, and non-profit work. We are still looking for board members to join our team, so please contact us if you're interested in changing our food system! Carley-Jane is the founder of the Alder Food Security Society and wears many hats in our food community. She been involved in food production through her time working as a farm hand with Riverbend Gardens, farmers' markets through her role as the Market Manager for the Southwest Edmonton Farmers' Market, and has completed research on farmers' market programming in the Edmonton area as an Agriculture and Resource Economics student at the University of Alberta. She is an avid community gardener at Our Urban Eden downtown and is the youngest citizen appointed to the Edmonton Food Council. Carley-Jane is a strong advocate of equitable food systems and believes that by reclaiming our identity as citizens with strength beyond purchasing power, we can revolutionize our food system. She is excited to work with Edmontonians and the Alder Food Security Society board to make our food system a more equitable community. Molly is the treasurer and secretary for the Alder Food Security Society. She comes from a background of performing arts, arts management, and has experience in the not-for-profit sector. A dancer, Molly moved to Montreal to continue her studies at Concordia University as a Major in Contemporary Dance. After she returned to Edmonton, she enrolled in the Arts and Cultural Management Program at Grant MacEwan, and was appointed Executive Director of the Common Ground Arts Society (CGAS), an Edmonton not-for-profit dedicated to the promotion, advocacy, and development of emerging artists. In 2012, Molly was hired as Executive Assistant to the Executive Director or the Child and Family Services Council for Quality Assurance. The Council is a multidisciplinary body identifying effective practices for improving and strengthening child intervention services. In early 2014, Molly was offered the position of Executive Coordinator and Board Liaison for the Edmonton Symphony Orchestra and Francis Winspear Centre for Music. Molly is very excited to be a part of the Alder Room Food Security Society. She hopes to be a part of a shift in Alberta policy making and believes the work of the AFSS will help allow food to be more accessible for low-income people and families and will help provide safe employment and learning opportunities for all Edmontonians. Molly is an active feminist, a pug lover, and loves Edmonton! Kathryn founded her cooking school, Get Cooking, in 2011, and moved the business into its current location at MacEwan University downtown in September 2014. Get Cooking added a café, Get Cooking To Go, at the same time. Kathryn’s cooking classes draw on her passion for the culinary traditions of the world as well as her commitment to supporting local producers and suppliers with the use of fresh, local and artisanal ingredients. Get Cooking frequently offers classes with local farmers and producers, as well as classes including tours of the Downtown Farmer’s Market. 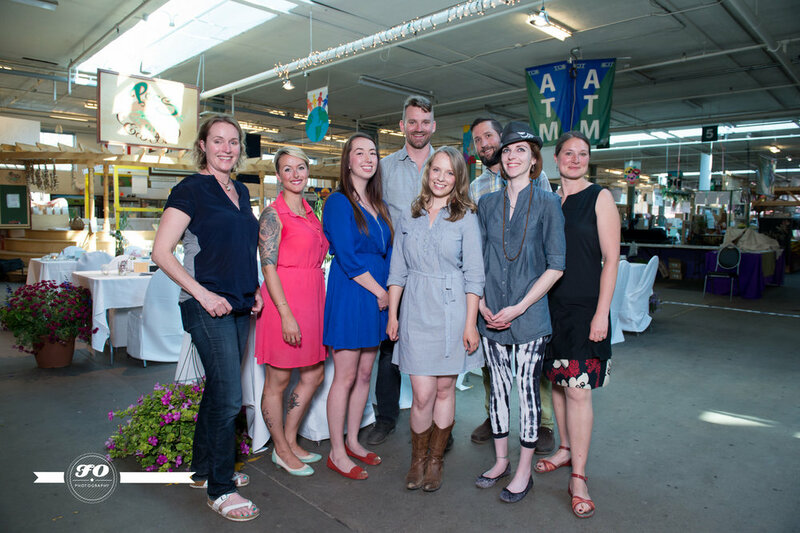 And in 2014 Kathryn conducted Farmer’s Market Tours for Taste of Edmonton too – she’ll be leading more tours in 2015. Jalene grew up in Edmonton, and spent 7 years in Montreal pursuing her education at Concordia University, where she obtained a Bachelor of Arts in Sociology and Human Relations. During her University career, she was the President of the Concordia Animal Rights Association (CARA), was Vice-President of the Montreal World Vegan Day Fashion Show, and volunteered as an Education & Prevention Facilitator with Aids Community Care Montreal (ACCM). While living in Montreal, Jalene was also the Manager of a busy restaurant, furthering her interest in the sustainability and environmental impact of our current food systems. Jalene has always associated food with activism and culture. She has seen the successful correlation between food and lifestyle change through her transition to a plant-based diet 7 years ago. She is passionate about teaching people that local food can be affordable, delicious, attainable and sustainable. Through her activism in University groups as well as her restaurant management experience, Jalene has worked with a large variety of people and believes in the success of empowering people to better their lives. Currently, she is a stay at home mom to her son, and is excited to enrich her community involvement within her hometown through the Alder Food Security Society. She believes that the organization can truly benefit a large and deserving demographic of Edmontonians and promote the rich diversity of Alberta grown food. The journey that brought Amanda to join the Alder Food Security Society is characterized by experiences that have helped illuminate the connections between food and community, along with an evolving understanding of the entrenched systems that support unequal access to high quality local food, and a growing desire to do something about it. She is excited to lend her time and skill to a group that seeks to act on many levels to reduce food insecurity in Edmonton. Amanda feels fortunate to have been raised in a Ukrainian family consisting primarily of farmers and sons & daughters of farmers. This afforded her many opportunities to connect with the land, participate in harvesting and preserving, and celebrate with others around a co-created feast. She moved to Edmonton in 1997 to pursue studies at the University of Alberta, and after some time in her professional field, returned to work at the U of A in 2003 and currently enjoys an appointment as an Assistant Professor. Extracurricularly, she devotes time to three food organizations, recently completing a 2-year term as Membership Director for Slow Food Edmonton, starting her 2nd year with Eat Alberta as Programming Director, and 3rd year as a volunteer with Operation Fruit Rescue Edmonton. She and her husband Eric also commit significant time and energy turning most of the land on their property into edible landscaping, taking measures to reduce their environmental footprint, teaching their dog and cat new tricks, and playing tennis. Mike Hudema has been a longtime creative activist in Edmonton and beyond and is currently a climate campaigner with Greenpeace Canada working on issues like tar sands development and renewable energy. For his work, he was named one of Alberta’s 50 Most Influential People in 2014 by Alberta Venture and was one of the Globe and Mail's tar sands 'difference makers'. In his spare time Mike loves hosting brunch and believes that food is a great way to connect people and communities. He recently co-founded a culinary competition called Edmonton Food Fight that pits some of Edmonton's finest chefs against each other in a one hour culinary battle.